The Chaparral 1, in very good company, coming back from the hill. Look at all the tents and other facilities in the background and you'll understand the size of this event. Cobras wait for the Chaparral 1 in the Parc Fermé. Hall walks back to the paddock. The 2A, with Lord March driving, and the 2F ride to the starting line. The famous 66 and uhh.. 65? Impressive back ends. Left: 2F and the 2J (right) just did some vacuum cleaning! High Tech 2J aluminum art. Red accents: Phil Hill (world champion in 1961 with the 'Shark nose' Ferrari) signing autographs in a red jacket. In the back is the red 2F wingtip. Red Ferraris on display in front of the Castle of Lord March. Hall and Augie Pabst share a light moment. 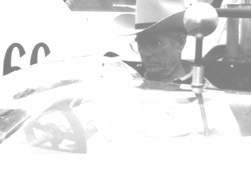 Pabst drove a Chaparral 1 in the early Sixties. When I asked him for an autograph, he was very surprised by the fact that somebody even knew of his existence! Right: Troy Rogers under the Pennzoil umbrella. I shared this umbrella with him during one of the many showers. Staring at the rain I said: "It's like Sebring '65." He said: "yeah" and started to tell me some stories about that particular race. Buy the book of Friedman and you'll know a lot about this crazy race as well! Smoking is what they just did all weekend! Hall, with Stetson in the back, is looking after Lord March in the 2A.